Short: some may want to hang on, but nothing wrong with taking profits. Long: are we looking at the same chart !!!?!? The MTFS crossover does not indicate any recovery potential, and while Entropy seems to have bottomed it remains very low. EntBin is quite low at -4 though, but it has been low for a few days. In such situation a congestion at this low level is possible, but this support level is not very strong, so RUT could drift more altough there is no clear Fib level to aim to. The next strong MM support level is 688, which surprisingly is lower than on the daily chart. Daily: down but 719 may hold for now. The down drift may continue until lines eventually bounce in oversold territory. The previous recovery pattern (started end Nov) failed, so we have to wait for the next one... or adjust to a new bear trend. For the time being, Entropy indicates little energy either way, so RUT may stay congested (with a lower bias) for a while. MTFS is not looking too good, while its significance level is picking up. A support must be found soon otherwise RUT will definitely turn to correction mode down to 680. 60mins: likely congestion or down drift. The MTFS crossover came too early to indicate a recovery and Entropy hasn't bottomed yet, so we may have a congestion at best, otherwise SPY could well also drift to the stall level around 139, just above the strong support level at 137.50. 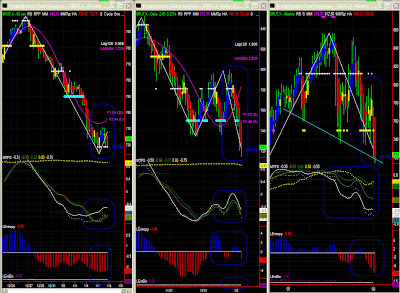 NB: EntBin is very low at -4 (Min is -5) though so a bottom may occur soon. Like with NDX, we are surprisingly not in a very bearish environment just yet. SPY could drift further (137.75?) or just remain congested at this low level for a while (~140.60). 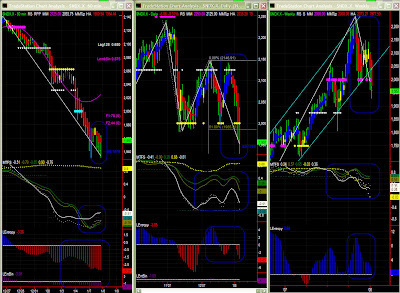 Again, this time frame has difficulty adapting to the current market moves at the moment. We would like to see Entropy stabilising for a possible recovery. We have to watch current levels or possibly 137.75 for a stronger support level now. Long: you must be mad! NDX could pause at this level, or even hold the position until negative pressure is exhausted. We are however more likely to see NDX coming down still. The market is not the easiest to read on account of various expectations on forthcoming rate cuts. 60mins: possible congestion or slower price erosion. As mentioned yesterday, NDX found support on 1938 and even picked up a bit on the last hour of trading to close at stall level above 1950. NDX may hold at this level but this is unlikely to last long. 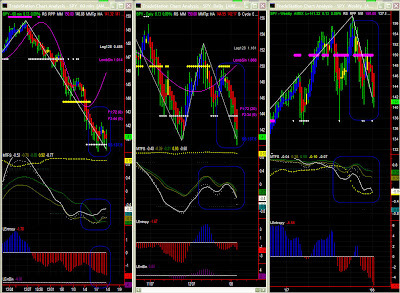 We know that such MTFS line crossover pattern is not conducive to recovery and Entropy has not bottomwed yet. Daily: drifting down looking for support. MTFS is driven by its lines gradient right now. Amazingly, MTFS line levels are not indicative of a market fall (Entropy either actually), so the 1938 support level may hold. The overall MFS pattern is not a conventional one (or close to a 'failed recovery' pattern), so we'll probably stay in a broader trading range until lines finally converge in oversold territory. Volatility has however already pushed levels pretty wide apart so the next support level may well be below 1900 at around 1875. We should only note the clear down bias for now, and focus on shorter time frames. Please also note that Swing is still hesitant at this level and could therefore turn up again.